American technology satellite. An engineering test satellite. Based on orbital position data derived from its transmissions, the shape of the earth was refined. Status: Operational 1957. First Launch: 1957-12-06. Last Launch: 1958-04-29. Number: 4 . Gross mass: 1.00 kg (2.20 lb). Vanguard TV3 was the first U.S. attempt to launch a satellite into orbit around the Earth. It was a small satellite designed to test the launch capabilities of a three-stage launch vehicle and study the effects of the environment on a satellite and its systems in Earth orbit. It also was to be used to obtain geodetic measurements through orbit analysis. At launch the booster ignited and began to rise but about 2 seconds after liftoff, after rising about four feet, the rocket lost thrust and began to settle back down to the launch pad. As it settled against the launch pad the fuel tanks ruptured and exploded, destroying the rocket and severely damaging the launch pad. The Vanguard satellite was thrown clear and landed on the ground a short distance away with its transmitters still sending out a beacon signal. The satellite was damaged, however, and could not be reused. It is now on display at the Smithsonian Air and Space Museum. The exact cause of the accident was never determined, presumably it was due to a fuel leak between the fuel tank and the rocket engine, possibly due to a loose connection in a fuel line or low fuel tank pressure allowing some of the burning fuel in the thrust chamber to leak back into the fuel tank. 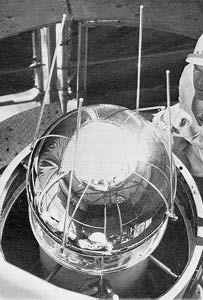 The spacecraft was a 1.36-kg aluminum sphere 15.2 cm in diameter, nearly identical to the later Vanguard 1. It contained a 10-mW, 108-MHz mercury-battery powered transmitter and a 5-mW, 108.03-MHz transmitter powered by six solar cells mounted on the body of the satellite. Six short aerials protruded from the sphere. The transmitters were used primarily for engineering and tracking data, but were also used to determine the total electron content between the satellite and ground stations. Vanguard also carried two thermistors to measure the interior temperatures in order to track the effectiveness of the thermal protection. Family: Technology, Technology satellite. Country: USA. Launch Vehicles: Vanguard. Launch Sites: Cape Canaveral, Cape Canaveral LC18A. Agency: USN. Bibliography: 126, 17, 18, 2, 4189, 4190, 4191, 4193, 4194, 6, 86, 7011, 13323, 13324. 1955 October 7 - . Launch Vehicle: Vanguard. Vanguard contract awarded. - . Nation: USA. Program: Vanguard. Class: Technology. Type: Navigation technology satellite. Spacecraft: Vanguard 1. Prime contract for Project Vanguard awarded the Martin Co..
1957 May 1 - . Launch Vehicle: Vanguard. Vanguard suborbital test. - . Nation: USA. Program: Vanguard. Class: Technology. Type: Navigation technology satellite. Spacecraft: Vanguard 1. Vanguard Test Vehicle (TV-1), a modified Martin Viking first-stage and Vanguard solid-propellant third-stage Grand Central Rocket as second-stage, launched with instrumented nose cone to an altitude of 121 miles and met all test objectives..
1957 October 1 - . Launch Vehicle: Vanguard. Vanguard tracking system operational. - . Nation: USA. Program: Vanguard. Class: Technology. Type: Navigation technology satellite. Spacecraft: Vanguard 1. Project Vanguard world-wide tracking system (minitrack) became operational..
1957 October 9 - . Launch Vehicle: Vanguard. Vanguard supported by Eisenhower. - . Nation: USA. Related Persons: Eisenhower. Program: Vanguard. Class: Technology. Type: Navigation technology satellite. Spacecraft: Vanguard 1. President Eisenhower in a White House press release congratulated the Soviet scientists on SPUTNIK I. He gave a brief history of the development of the U.S.-IGY satellite program and pointed to the separation of Project Vanguard from work on ballistic missiles. 1957 December 6 - . 16:44 GMT - . Launch Site: Cape Canaveral. Launch Complex: Cape Canaveral LC18A. Launch Pad: LC18A. Launch Vehicle: Vanguard. FAILURE: Vehicle lost thrust and exploded after 2 seconds.. Failed Stage: 1. Vanguard 1A - . Payload: Vanguard Test Satellite. Mass: 1.00 kg (2.20 lb). Nation: USA. Agency: USN. Program: Vanguard. Class: Technology. Type: Navigation technology satellite. Spacecraft: Vanguard 1. Decay Date: 1957-12-06 . First US orbital attempt. IGY Vanguard (TV-3), the first with three live stages, failed to launch a test satellite..
1958 February 5 - . 07:33 GMT - . Launch Site: Cape Canaveral. Launch Complex: Cape Canaveral LC18A. Launch Pad: LC18A. Launch Vehicle: Vanguard. FAILURE: Control system malfunction - control lost after 57 sec.. Failed Stage: G.
Vanguard 1B - . Payload: Vanguard Test Satellite. Mass: 1.00 kg (2.20 lb). Nation: USA. Agency: USN. Program: Vanguard. Class: Technology. Type: Navigation technology satellite. Spacecraft: Vanguard 1. Decay Date: 1958-02-05 . Apogee: 6.00 km (3.70 mi). Trial firing of IGY Vanguard (TV-3Bu) satellite..
1958 March 17 - . 12:15 GMT - . Launch Site: Cape Canaveral. Launch Complex: Cape Canaveral LC18A. Launch Pad: LC18A. Launch Vehicle: Vanguard. Vanguard 1 - . Payload: Vanguard 1C / Vanguard Test Satellite. Mass: 2.00 kg (4.40 lb). Nation: USA. Agency: USN. Program: Vanguard. Class: Technology. Type: Navigation technology satellite. Spacecraft: Vanguard 1. USAF Sat Cat: 5 . COSPAR: 1958-Beta-2. Apogee: 3,868 km (2,403 mi). Perigee: 654 km (406 mi). Inclination: 34.20 deg. Period: 133.20 min. Transmitted pear-shaped earth data. Life expectancy of perhaps a 1,000 years. The satellite had a mass of 1.6 kg and a diameter of 175 cm..
1958 April 29 - . 02:53 GMT - . Launch Site: Cape Canaveral. Launch Complex: Cape Canaveral LC18A. Launch Pad: LC18A. Launch Vehicle: Vanguard. FAILURE: Third Stage failed to ignite.. Failed Stage: 3. Vanguard 2A - . Payload: X-ray-environmental satellite. Mass: 1.00 kg (2.20 lb). Nation: USA. Agency: USN. Program: Vanguard. Class: Technology. Type: Navigation technology satellite. Spacecraft: Vanguard 1. Decay Date: 1958-04-28 . Apogee: 550 km (340 mi). 1960 March 17 - . Launch Vehicle: Vanguard. Vanguard second anniversary. - . Nation: USA. Program: Vanguard. Class: Technology. Type: Navigation technology satellite. Spacecraft: Vanguard 1. VANGUARD I still in orbit and transmitting on its second anniversary after traveling 131,318,211 miles. NASA reported that VANGUARD I orbit was being altered by solar pressure..
1961 March 17 - . Launch Vehicle: Vanguard. Vanguard third anniversary. - . Nation: USA. Program: Vanguard. Class: Technology. Type: Navigation technology satellite. 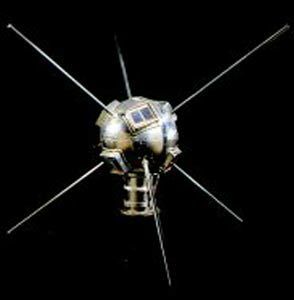 Spacecraft: Vanguard 1. 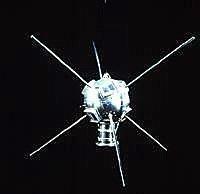 Vanguard I completed third year in orbit and was still transmitting. Vanguard I provided much useful data on orbits, including the slight pear-shape of the Earth and the effect of solar pressure. Vanguard also provided the second stage for the Able, Delta, and Able-Star, as well as the third stage of Scout, pioneering solid-propellant stages used in Polaris and Minuteman.